With new enforcement priorities under the Trump administration, Immigration and Customs Enforcement agents are taking aim at employers that knowingly hire unauthorized immigrants. The most recent — and largest — bust happened at a trailer manufacturing plant in northeast Texas. 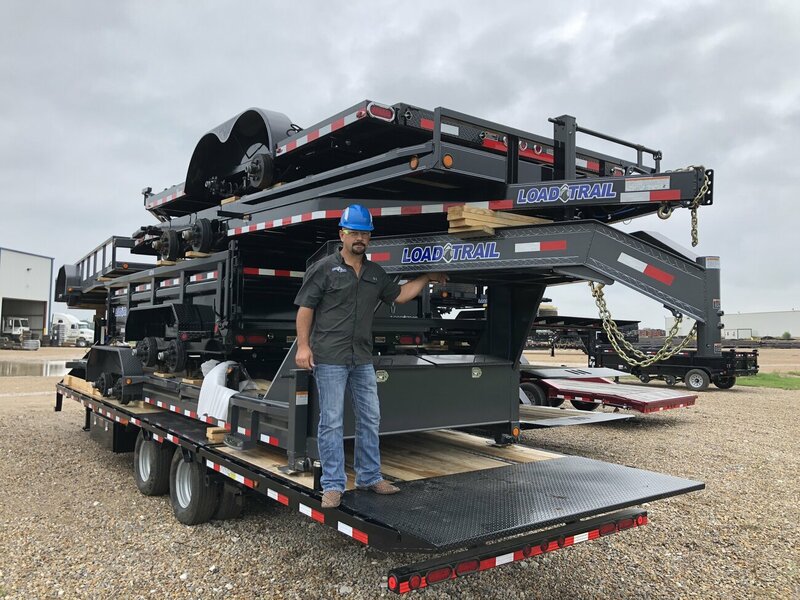 Business had been booming at Load Trail LLC, about two hours northeast of Dallas, as customers bought the black trailers to haul hay bales, topsoil, construction refuse and oilfield equipment. Then came the ICE raid in late August. Inside Load Trail's huge production building, welders turn raw steel into trailers, amid cacophonous clanging and showers of sparks. It's brutish labor — cut the heavy black metal, lug it into place, arc-weld it, repeat — but the production floor is nearly half-empty because of an acute shortage of welders. Load Trail CEO Kevin Hiebert remembers the morning of Aug. 28, when a helicopter thumped overhead and 300 ICE agents swarmed into his yard. "It looked like something you would typically see in the movies," he said, "not something you ever planned on living out in real life." ICE rounded up more than 150 employees — nearly a quarter of Hiebert's workforce — loaded them into buses and booked them for working in the country unlawfully. A criminal investigation of the company continues. So far this year, ICE agents have stormed 7-Eleven stores, a meatpacking plant, dairy and vegetable farms and a feedlot. Jake Thiessen's family founded Load Trail in Tigertown, Texas, which is home to a half-dozen major trailer manufacturers. Shortly after the Load Trail raid, ICE began auditing employee records of every trailer manufacturer in the community to find out which workers have fraudulent identity documents. "Businesses that knowingly hire illegal aliens create an unfair advantage over their competing businesses. In addition, they take jobs away from U.S. citizens and legal residents," said Katrina Berger, special agent in charge of Homeland Security Investigations in the Dallas ICE office. But you won't hear those complaints in Tigertown, Texas. This flyspeck community situated between cotton fields near the Oklahoma border is home to a half-dozen major trailer manufacturers — all competitors. And they all employ undocumented workers. "I think the manufacturing industry in Texas, any kind of steel fabrication construction, depends on illegal immigrant labor," Hiebert says. The head of a competing trailer-maker down the road agrees, saying they all use workers who are in the country illegally. He asked not to be named in hopes of staying off ICE's radar. It's too late for that, though: ICE is auditing the employee records of every trailer manufacturer in Tigertown to find out which workers have fake identity documents. Some unauthorized employees are so rattled they're not showing up for work. What the industry needs are legal guest workers, says Load Trail CEO Hiebert, "Especially now that they're cranking up on the enforcement. Everybody hopes that there'll be some kind of real immigration reform before what happened at Load Trail happens to them." In 2014, the company was fined $445,000 for employing more than 170 unauthorized immigrants at its plant. Hiebert says they hire whoever walks in the door, and they pay decent wages — $20 to $25 an hour. Still, they've always had a hard time finding welders. "The trailer industry is growing well," Hiebert says, "but manufacturers are unable to keep up with demand. It has to do with the inability to produce the product." So the work is done by men like Ignacio Barrios, a sturdy, 36-year-old welder who came here illegally from Oaxaca, Mexico. He worked at Load Trail for 17 years before getting swept up in the ICE operation. Texas has always been knowingly duplicitous when it comes to illegal immigration. He wears an American flag T-shirt and sits in the church that's helping to support his family of five now that he's out of work. Barrios paid a $5,000 bond to get out of detention and is waiting for his day in immigration court. "You have to work hard," he says in Spanish. "Lots of times you get injured, burned, you break your fingers. It gets over 100 degrees in there. I've seen that Americans don't want to do the kind of work that we do." Cal Jillson, a political scientist at Southern Methodist University in Dallas, says, "Texas has always been knowingly duplicitous when it comes to illegal immigration." On the one hand, Texas is a staunch law-and-order state where conservatives support Trump's immigration agenda; on the other hand, Jillson says, if ICE is too successful, "employers are wondering where they're going to find people to man their businesses if American high school graduates aren't going to do it." 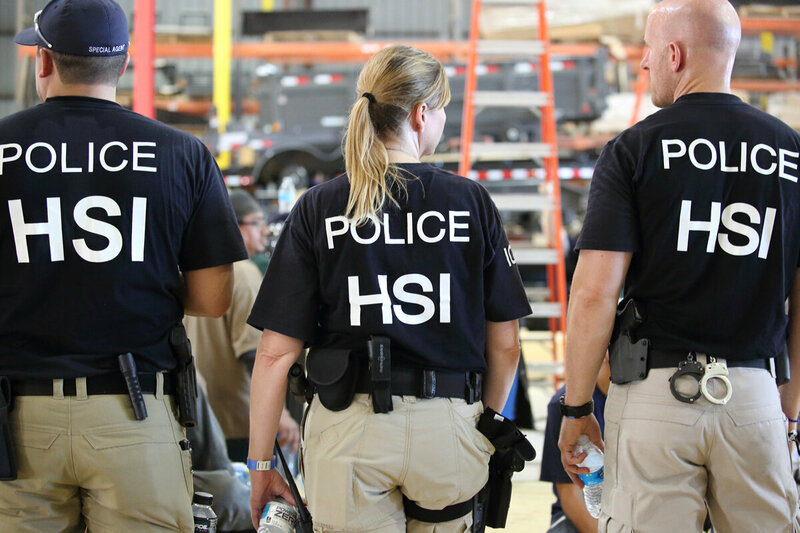 U.S. Immigration and Customs Enforcement's Homeland Security Investigations agents arrested more than 150 workers at a trailer-manufacturing business in North Texas. Lamar County, where the trailer manufacturers are headquartered, is crimson Trump country. Yet to hear the trailer bosses tell it, the administration's immigrant roundups threaten a lifeblood of the county. Locals who voted for Trump are nonetheless sympathetic to the hard-working, undocumented welders. Every morning, a group of retirees meets at the Dairy Queen in the county seat of Paris to drink coffee and mull over the state of the nation. "This country will not survive if we don't straighten the way [immigrants] can come over here and work. Because I guarantee you Americans are not gonna do it," says Alan Helberg, a former hospital administrator. His buddy, retired dentist Jerry Akers, chimes in, "Congress needs to get off their duff and pass some meaningful legislation to where people can come here and work legally and not have to be afraid of getting uprooted." Comprehensive immigration reform is, so far, dead in the water in the gridlocked Congress. And back at Tigertown, some trailer manufacturers say that if they can't find enough welders, they would consider moving their entire operations to Mexico.